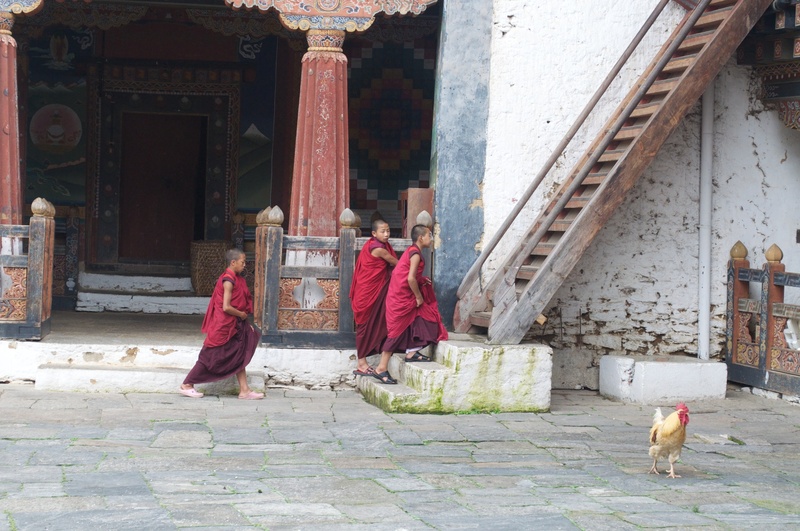 Our travels have taken us across the country and ow back to the west and the streets of Paro. As we traveled across the pass between Wangdue and Thimphu, we stopped and talked to a family raising prayer flags for a deceased relative. Families raise these flags in honor and memory of their passing and the flag poles, 15 to 20 feet tall, are markers of their life. We headed down the valley road into Thimphu for a lunch stop and visit to Namgay’s sister’s restaurant. We ate wonderful food, saw baby Atticus again, and were given hand-made journals and a small textile for each of us to carry. The reception was warm and truly wonderful. 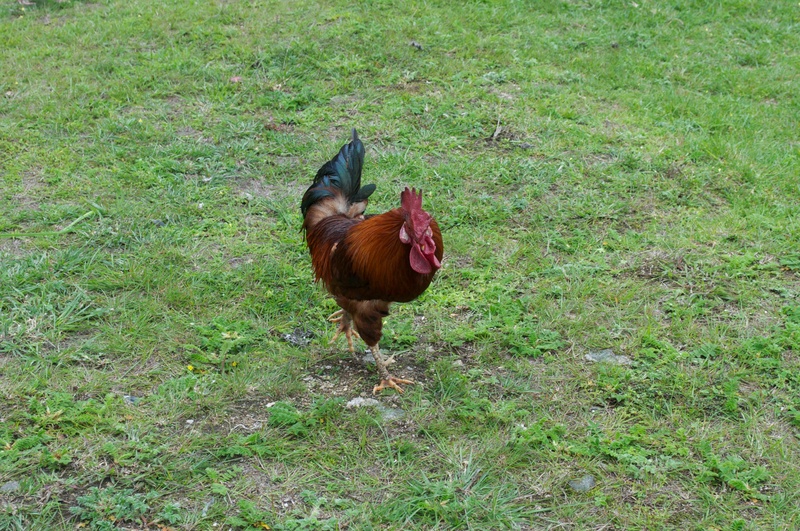 Atticus, of course, was the highlight of the event! 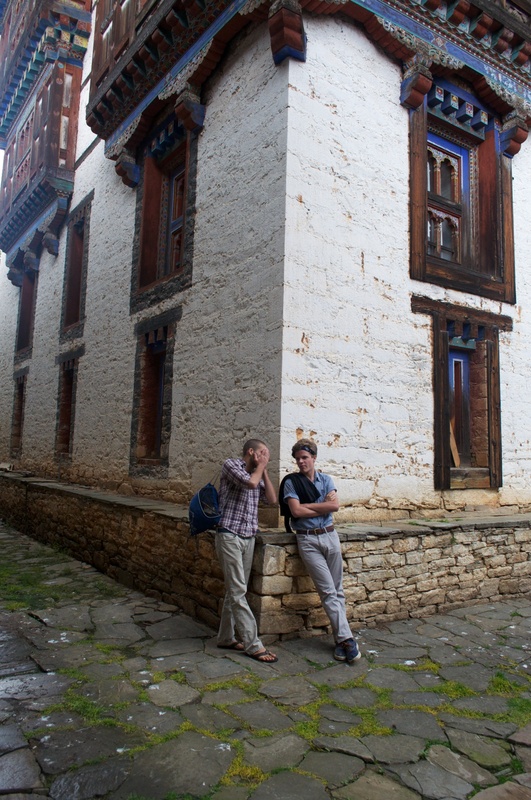 Our arrival in Paro marked the final destination of our trip. 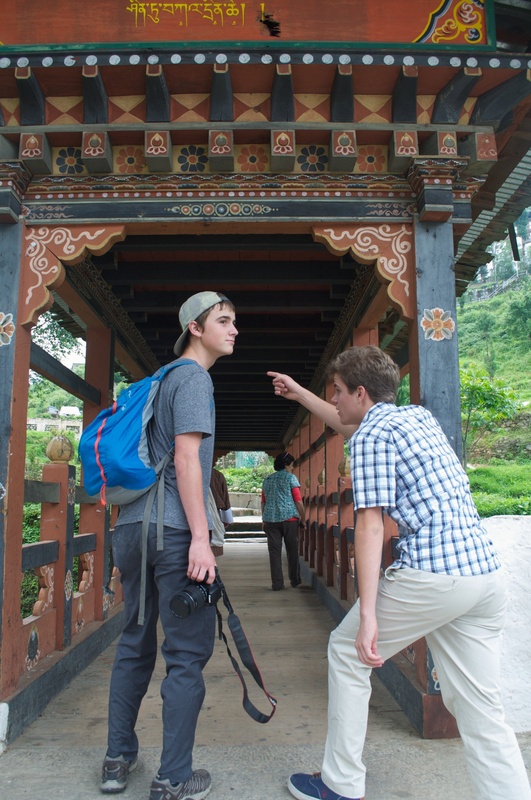 Tomorrow we head to the Tiger’s Nest, Taktsang temple on the cliff face of the Paro Valley. Playing with kids, Chamkar Town. Sebi gets his head shaved. 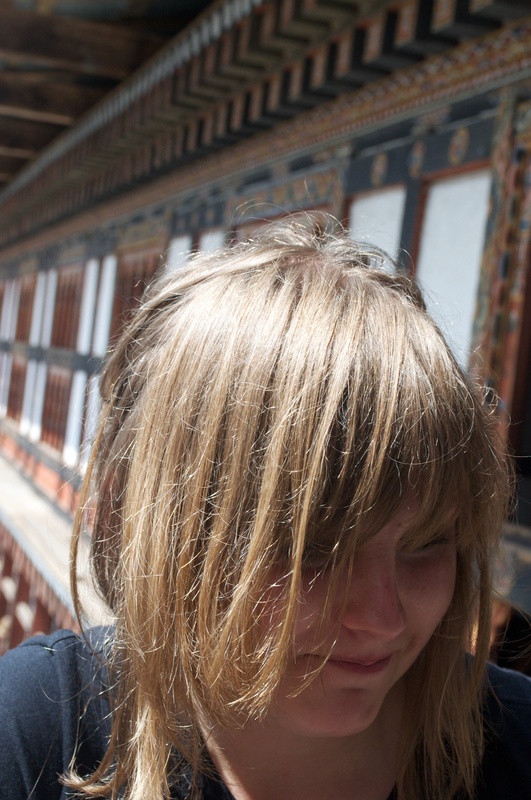 Layla, tired of the bus, now walking to Paro. 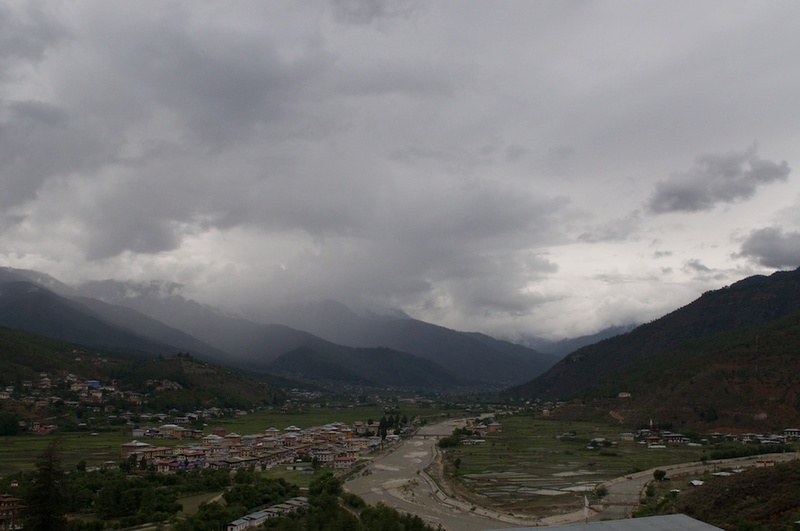 Phobijike Valley…home of the black-necked crane. Sitting in the dining area this morning, I wondered at the trip and the travel we have done. We have covered miles and miles of ground in the past eight days and this day promised to be the longest so far. 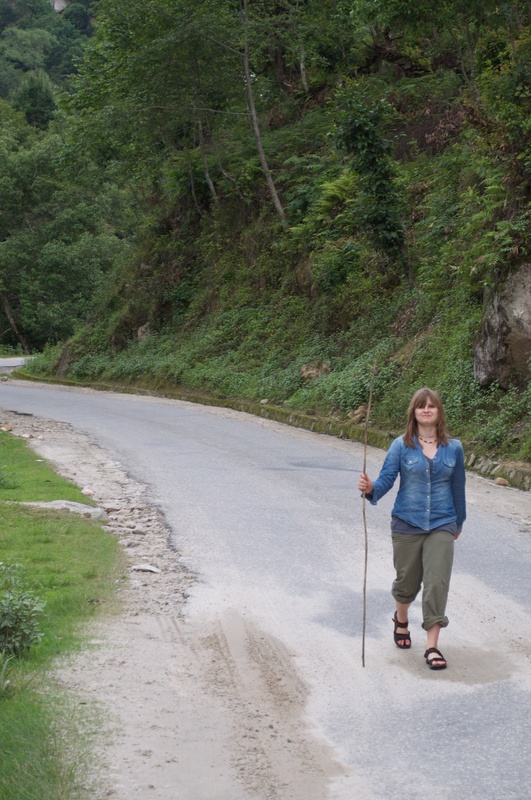 The thing to know about Bhutan is that the roads are one lane tracks that hug the mountains. I imagined looking at a topo map of Bhutan, the road carved into the side of mountains, contouring around each hill and valley. The road winds back and forth across the country. 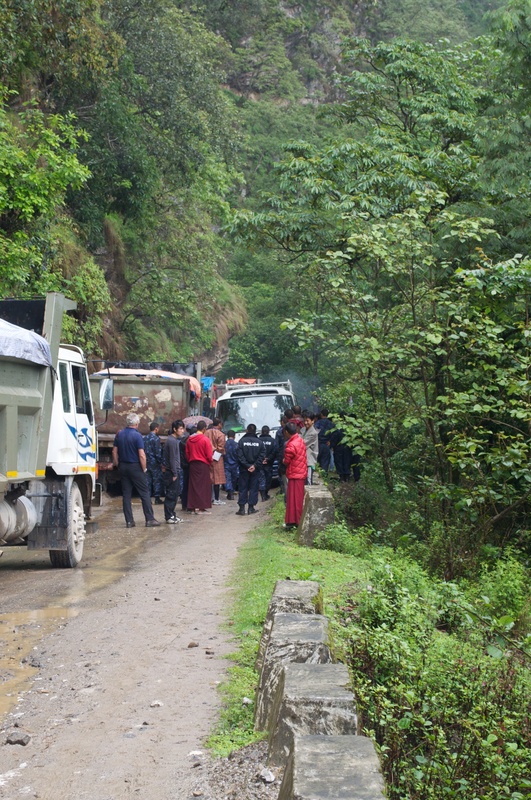 And this road is, in fact, the only West-East road in Bhutan, meaning that all traffic crossing the country must, by necessity, use this trunk road for all travel. The amazing thing is, it all seems to work fairly well. We passed TATA trucks, dump trucks, machinery of all sorts, small cars, big cars, SUVs, tiny vehicles….bikes, motorcycles and folks walking along the road. All headed in one direction or another traveling on this remarkable road. 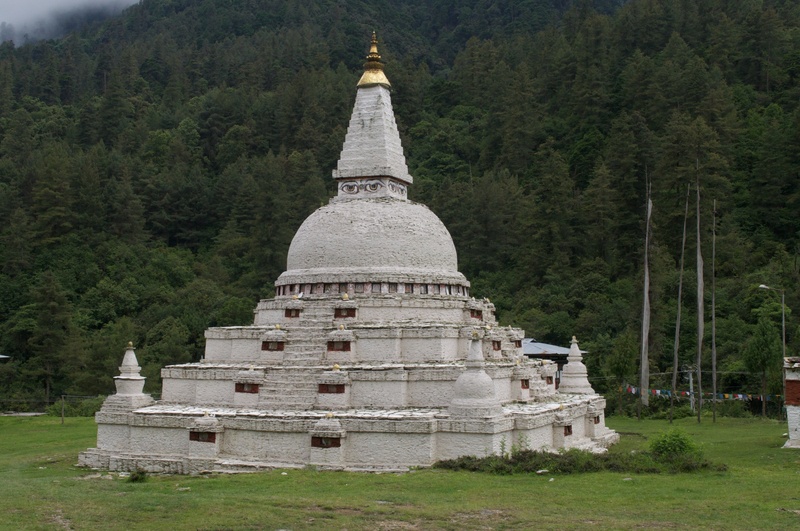 On the road to Wangdue, the stupa appeared. anxious or ADD, this scenario might seem like a nightmare. For those of us more patient, the travel becomes an experience in seeing a lot of scenery, flora, and fauna in this Asian nation. 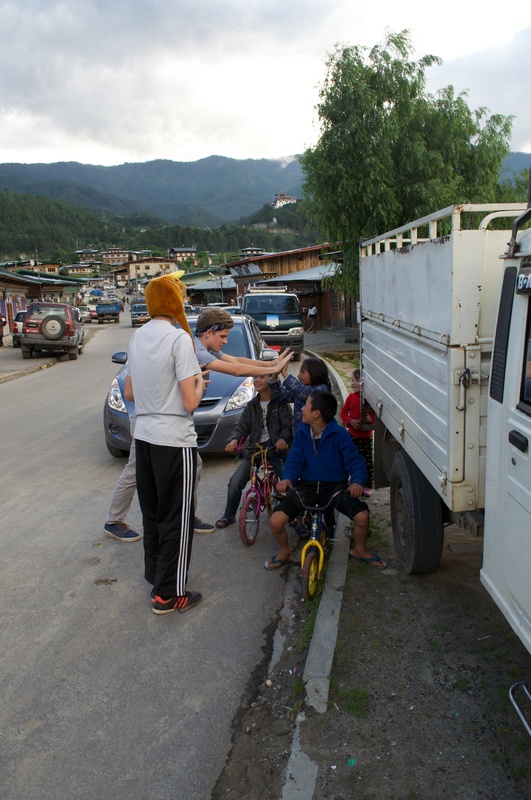 To summarize this day for you: we left Chamkar at 8:15 AM and arrived in Wangdue at about 6:45 PM (with numerous stops). 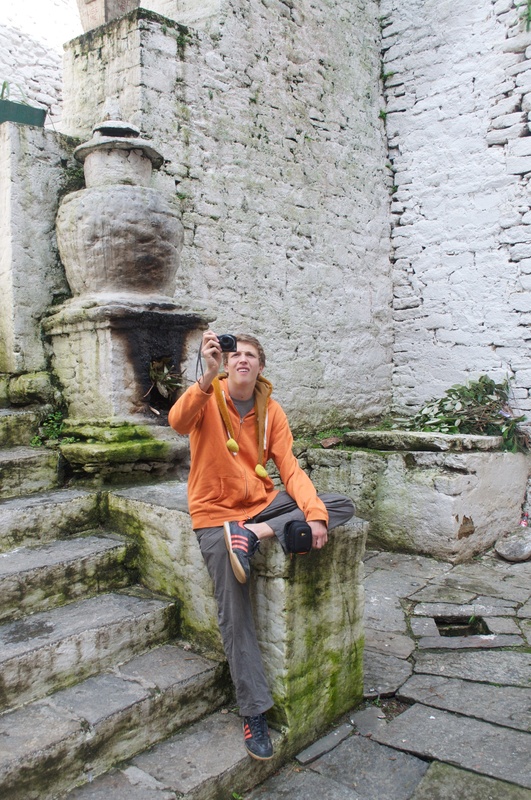 We saw landslides, stopped vehicles, temples, and ate lunch in one of the most serene places in the country. In fact, along this road are some of the most remarkable sights you can see in Asia. 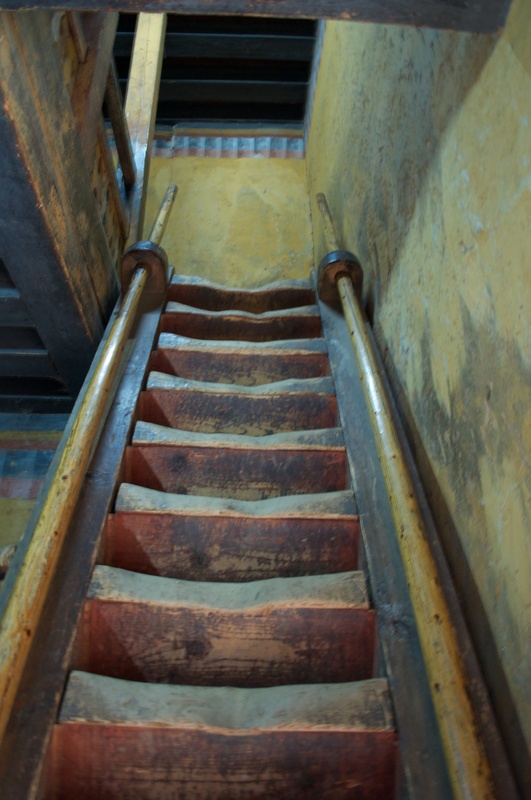 One of them, Chendebji Chorten is a stupa copied from the style of the great stupa in Kathmandu, Bodhanath. 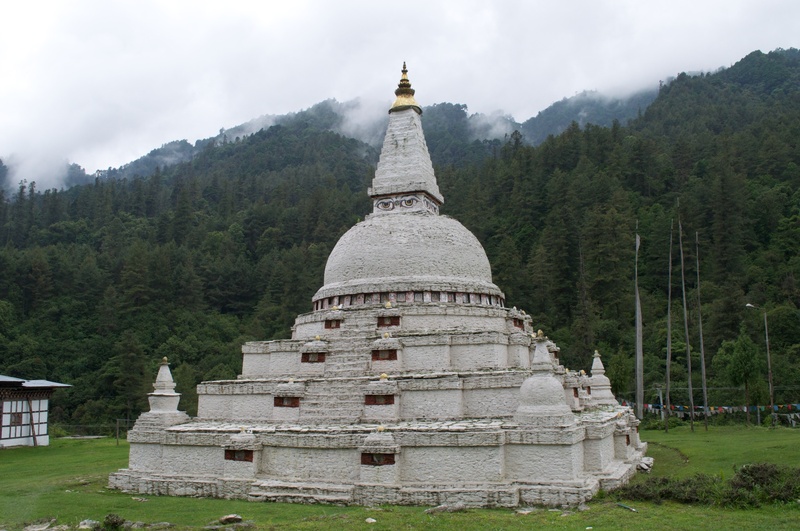 The stupa is white, rounded, and, at the top, the eyes of the Buddha face each direction. We stopped for lunch at this site as rain began to sprinkle on us in the dim daylight of the afternoon. The hotel we stayed at in Chamkar town prepared a boxed lunch that included eggs, sandwiches, cut vegetables, and a small cake. Our moments here we quite wonderful and the stream nearby offered a beautiful melody that passed through the trees surrounding the road. All in all, we traveled a long way (in terms of time spent in a vehicle) and saw a lot of the country of Bhutan. 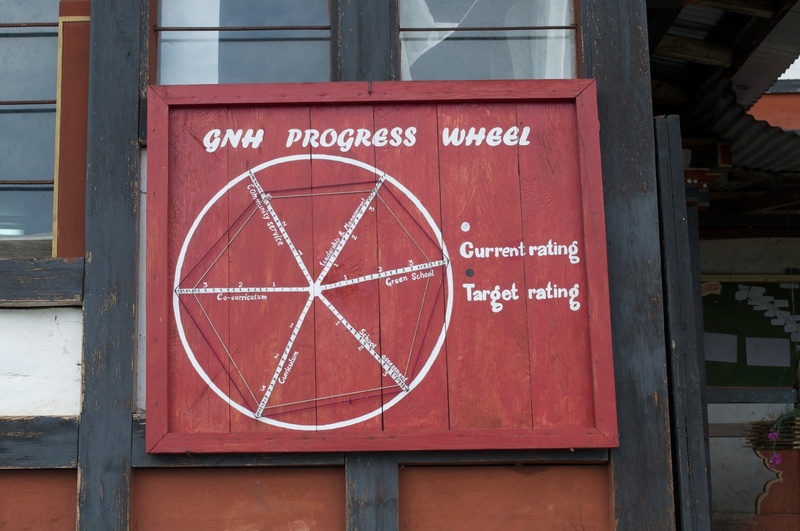 The school measures growth in terms of Gross National Happiness. The crowd gathers as Layla sings. Students followed us everywhere at the school. Cole and Layla in Namgay’s house. 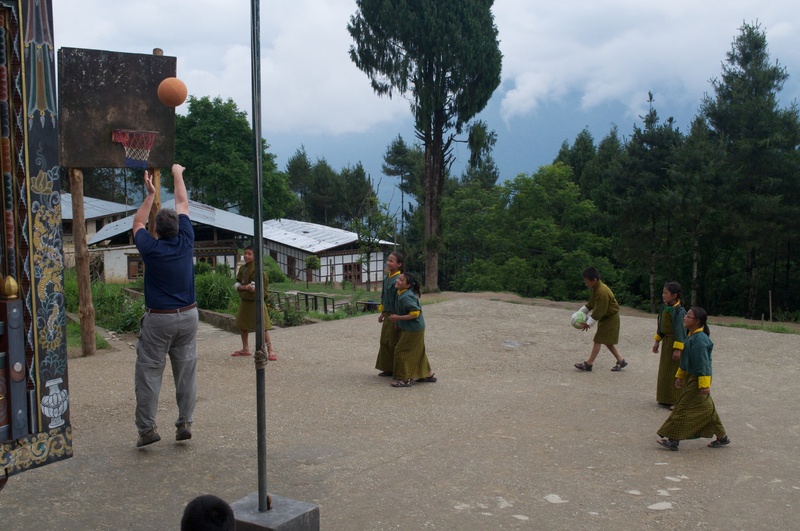 As we traveled toward Trongsa we stopped at Namgay’s former elementary school and walked to his village. We had the chance to meet with students, teachers, and the principle, and we offered the books we collected as a gesture of support. 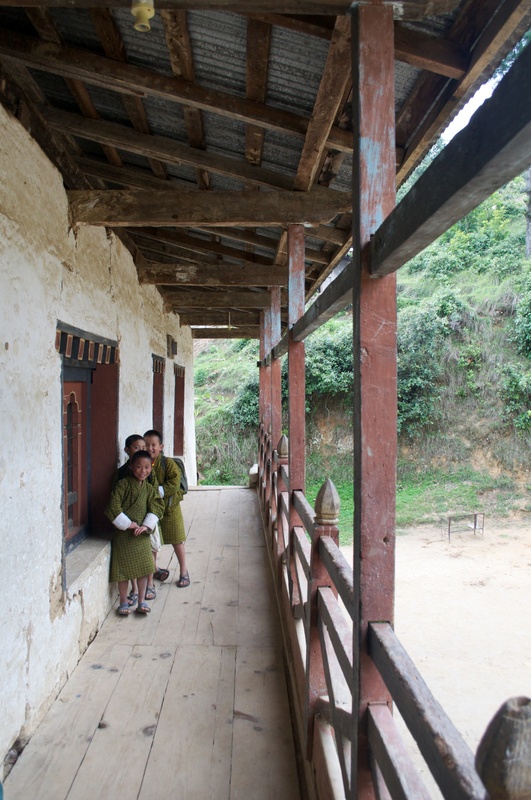 The school is a boarding school that also includes students from local villages. The facilities are very basic with one light hanging from the ceiling and students crammed into tiny rooms. 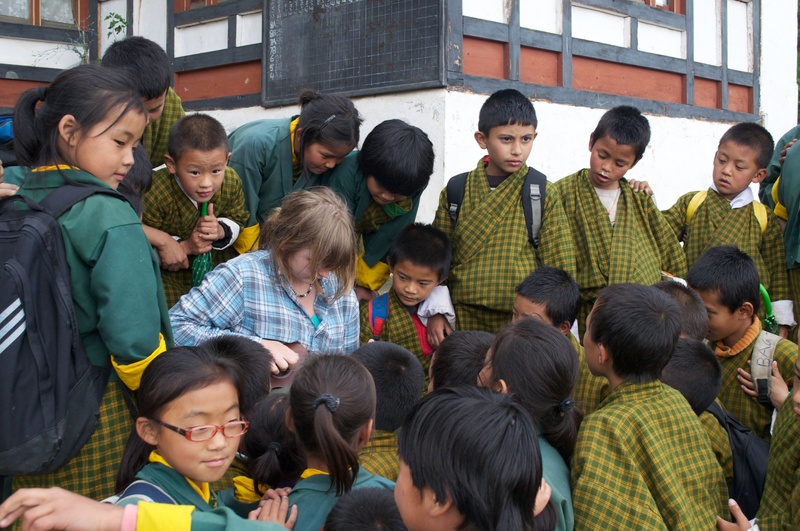 We met Sara, a Canadian teacher working at the school from the Canada-Bhutan Foundation. She was eager to show us around and the principle agreed. While the facilities are rough, Sara shared that the work is challenging and rewarding. Access to supplies is limited and even basic things like paper and crayons are hard to come by. We had already talked to Namgay about adopting this school and sending supplies the school needs, and I think this cause is both worthy and needed. More on supporting this school later. As we settled in and hung around students and teacher, Layla got out her ukelale and began playing. She immediately drew a crowd and they listened, silently. Layla played the songs she knew and they wanted more! In fact, I had to step in to prevent a melee as students started to push and shove wanting to get closer to her and the instrument! Layla plays for the crowd! We stayed until late in the afternoon and then headed over to Namgay’s village and his mother’s house. Namgay told us all stories he heard as a child about the Yeti that lives in the area, and we were all mesmerized by these tales. His mother fed us dried rice, cooked in sugar and butter and then dried to a crispy consistency. We also had butter tea, a combination of salt, butter, and black tea. The concoction was wonderful. What these kids really wanted was some of that kind of attention; structured play and engaged participation in an activity not associated with academics! 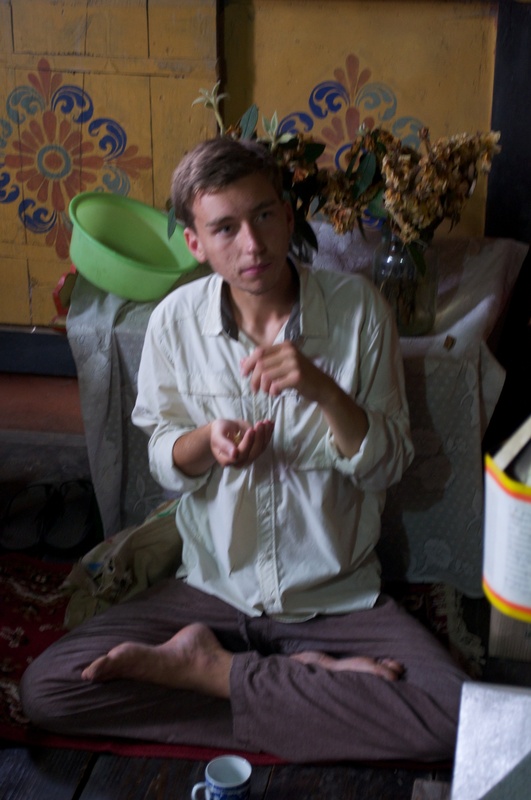 Jordan in Namgay’s family home. 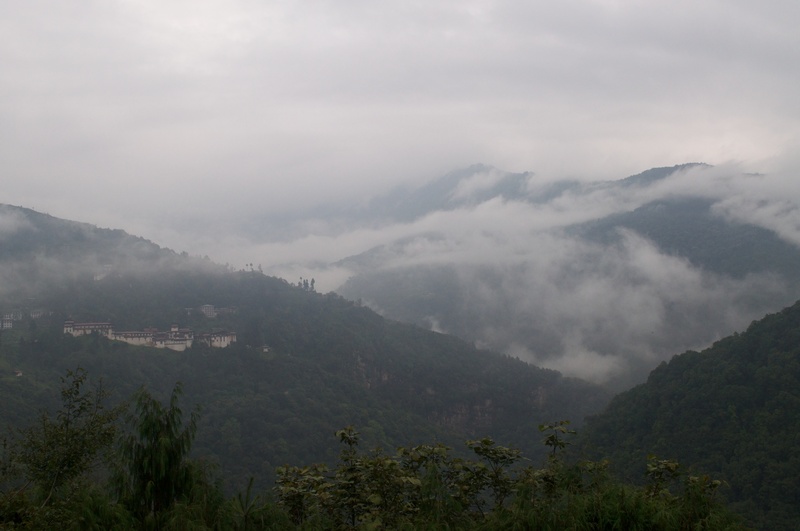 Early morning light near Trongsa Dzong. Stupa on the road to Bumthang. 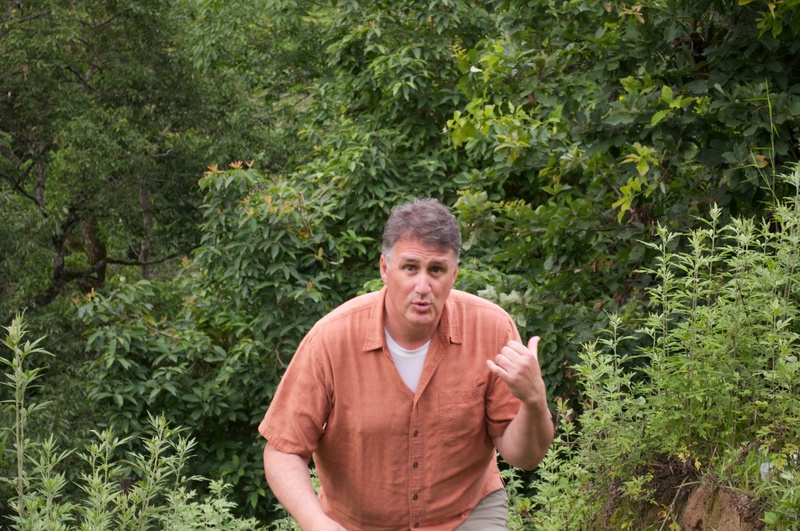 Matt, as always, pointing the way! After our visit to the museum we headed to a local nunnery. 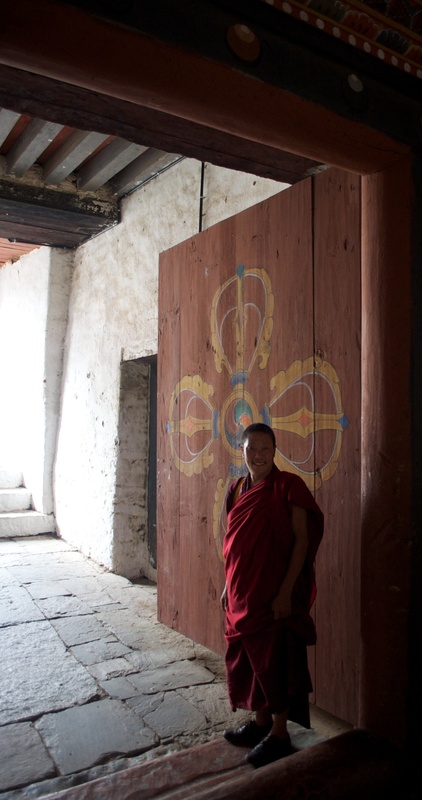 The women are supported by an important lama and financially by an American family from Texas. On our visit, Sebi decided to have his head shaved and a nun came out and shaved Sebi’s head in the same way the nuns shave their own heads. See the pictures for the details! 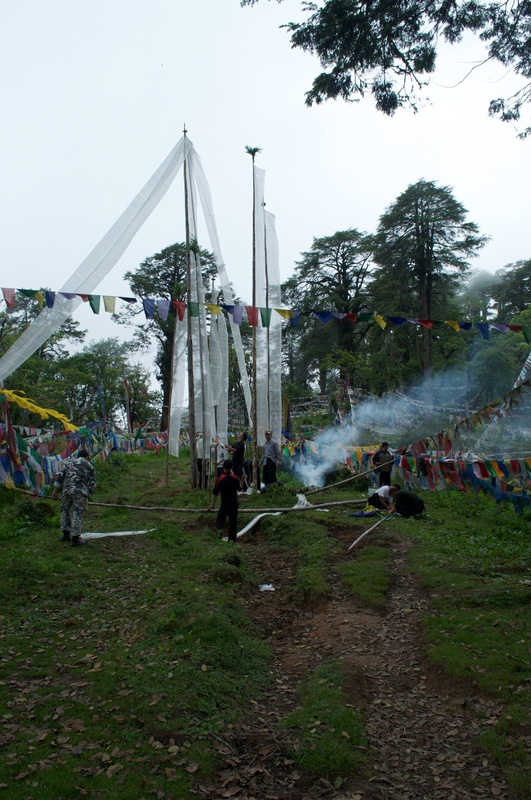 Our last stop before returning to Chamkar was a visit to Burning Lake. 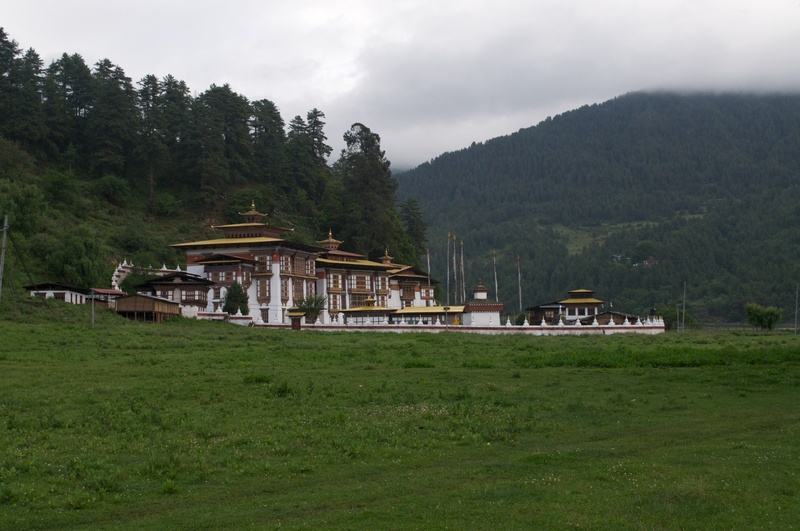 According to local history, Terton Pema Lingpa was born with the ability to find secret writings handed down by the founder of Buddhism in Bhutan, Padmasambhava. 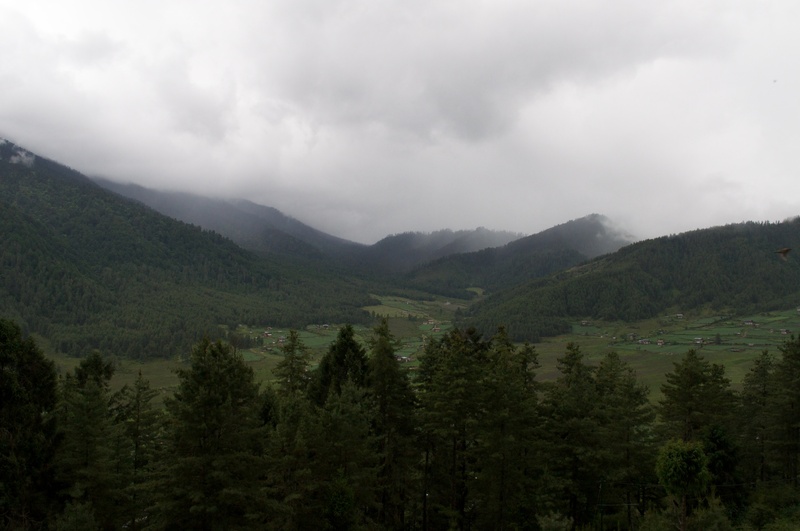 Lingpa was not believed and he was forced to prove that he was given the gift of finding Padmasambhava’s secret writings (hidden throughout the Himalaya region). 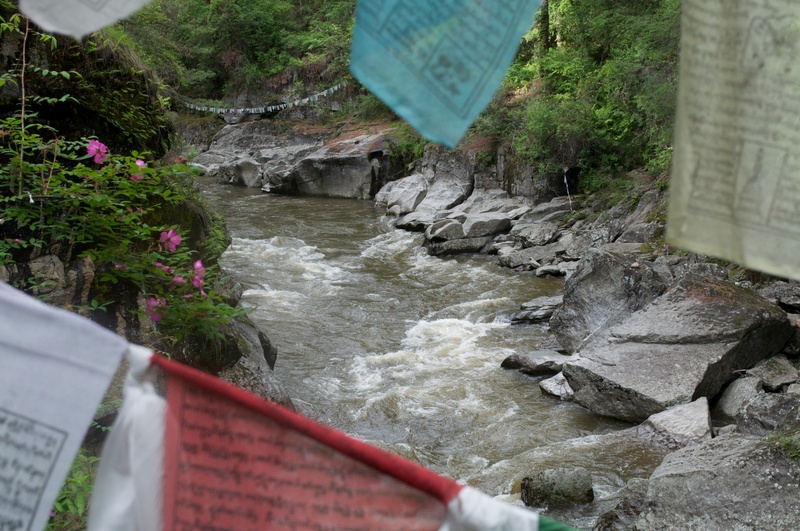 Lingpa agreed to a test and led many people from the local village to a point on a river where the water pooled into a small lake. At this point, Lingpa told the people that he would show them he was the “terton” or finder of these texts. He took with him two butter lamps and jumped into the water. When he came out the lamps were still lit and a light appeared in the water revealing the path to enlightenment for those willing to look. 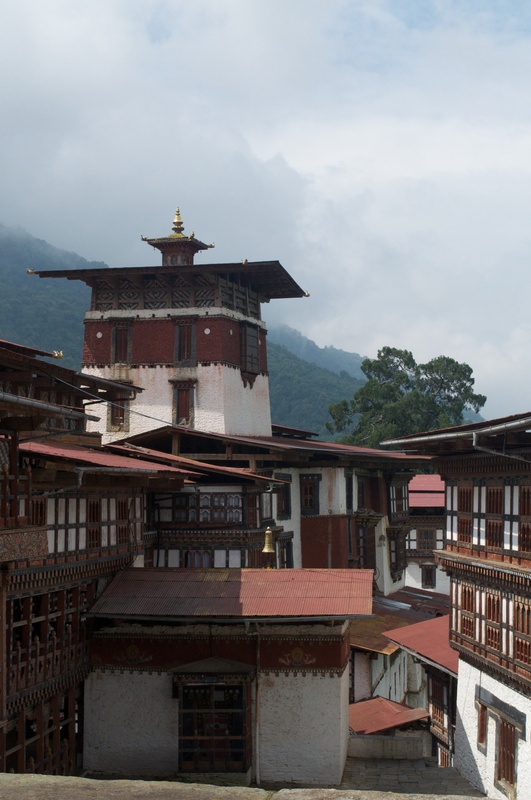 From that point on, Lingpa became an important leader of Buddhism in Bhutan in the 15th century and found more than thirty hidden documents written by Padmasambhava. After our long day, the group stopped in Chamkar and Sebi, Matt, and Jordan purchased a tradition outfit for men called a Gho. 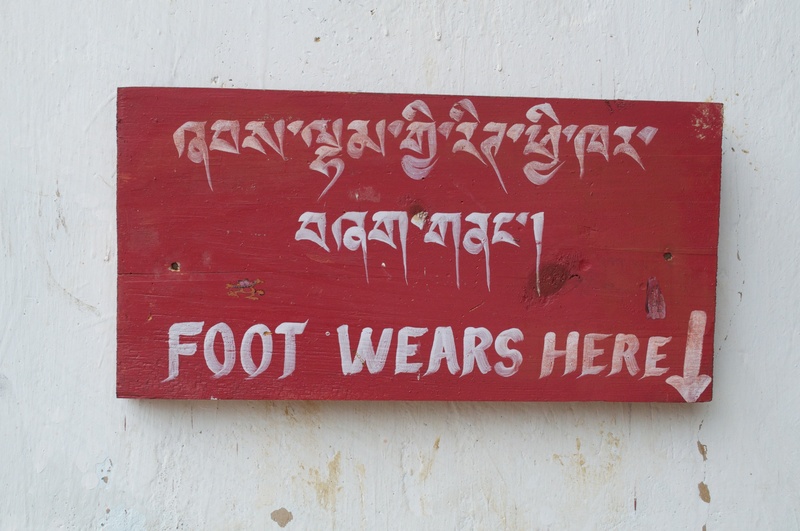 All men and boys in Bhutan wear this outfit and each was fitted with the perfect one for them! We headed back to the hotel and prepared for an evening of conversation and laughter.